I’d been a thrash fan for a few years by 1992, but, truth be told, most of these sorts of albums tended to sound rather samey. 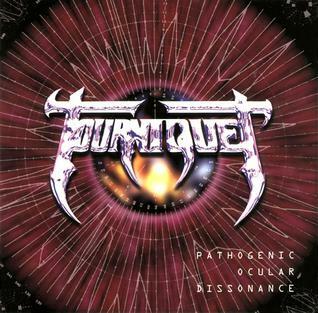 And then Tourniquet, already CCM’s premier thrash band, released Pathogenic Ocular Dissonance, as notable for the titles of its tracks (e.g. ‘Gelatinous Tubercles of Purulent Ossification’) as for the intricacy and imagination of its music. This remains, in my view, the best metal album ever conceived. The title track is fantastic, but the rest of the album is so-so in my view. Not really my genre I suppose, but I can't emphasise enough how good a track Pathogenic Ocular Dissonance is. Yeah . . . I think the reason why 'Phantom Limb' is my 'standout track' is simply because of the bass opening. As a bass player, I can't resist that! From the point of view of someone who (kind of) plays guitar; it's a fantastic album. I agree with James though, the title track is one I find myself listening to the most. It's certainly the most accessible - some of the other tracks are hard work but rewarding!